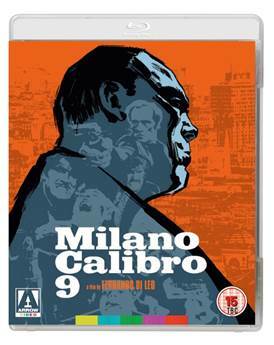 Milano Calibro 9 (Caliber 9) is an Italian gangster film released back in 1972 which at last is available on Blu-Ray. Gaston Moschin plays Ugo Piazza, a gangster who’s just been released from prison after three years. But Piazza can’t rest as he is still accused of stealing 300,000 lire from his former employer, the Americano (Lionel Stander). So what follows is a tale of revenge, double and triple cross on the streets of Milan. Moschin is excellent as Piazza, with a wonderful face while support from Stander as the gang boss and Mario Adorf (Rocco) is very solid indeed. Seeing the streets of Milan back in the early seventies is fascinating and director Di Leo creates a stylish and elegant demi-monde. The film has been restored so the picture is a step up from what was available before. It is refreshing to see a different take on the gangster tale and like the best Italian filmmakers, Di Leo knows how to tell a story. Despite a few dated touches, like its conclusion and its treatment of violence, Milano Calibro 9 is a compelling gangster tale with some great performances.